Okay, so now you know my personal story of finding resonance with a new way of keeping time. Maybe you’re interested in exploring whether the Gregorian calendar is subtly encouraging you to make life harder than it has to be. Maybe you’re curious about what the Mayan calendar can tell you about your personality and purpose. Maybe you just like me enough to keep reading whatever I write (Thanks! I’m totally touched.) Whatever the case, let’s start to look a little deeper at this whole calendar thing. 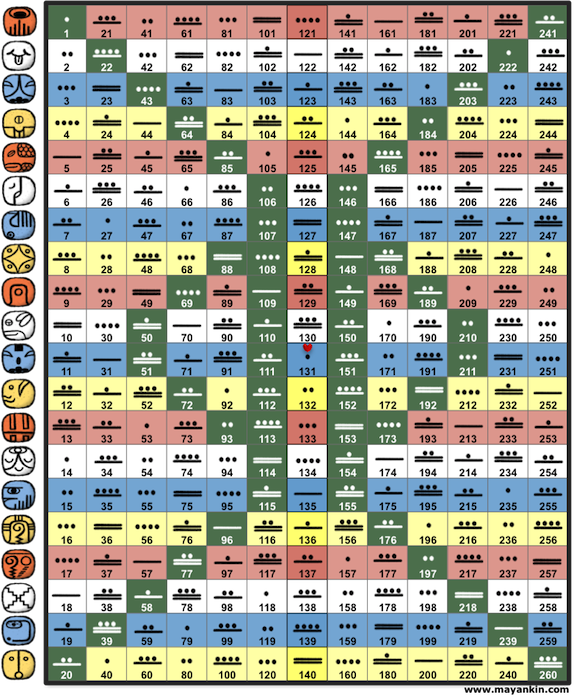 I mentioned in my earlier post that the calendar is made up of cycles of 260. The days progress through the cycle, each day with a combination of two elements: 20 possible fundamental essences x 13 actions that each of those essences can show up as = 260 “kin” total. These 260 kin may provide us a door to deeper understanding and acceptance of ourselves and others. Let’s get to know a bit more about them. First, the 20 fundamental essences (archetypes). An archetype is a character that has certain core qualities we can all relate to. You might recognize some major archertypes in a human lifecycle, for example: We’re all familiar with the nature of an innocent baby, a testing toddler, a loving mother, a doting grandfather. In the Mayan calendar, all things move through these essences of the natural world, and they’re presented in rich characters like Dragon, Wind, Night, and Seed. I was taught the 20 archetypes (or “glyphs”) within the form of a “creation story”, that traces the cycle of things in nature. This can be useful for helping starting to get a “feel” for each one (just like you get the “feel” of what an innocent newborn is, without needing an elaborate description). They represent a grand lifecycle.. I’ll describe the first few, to give you a sense of the way I learned them. (Of course, our collective interpretations will grow and refine over time, and your feeling of them may be different, if you start to explore this path, but this gives us some starting point). Anything in life starts by being born – whether that’s a baby emerging into the world, or an idea emerging in the mind. There’s a powerful mother who’s fire pushes that new being into the world (dragon). After a baby is born, it takes its first breath (wind archetype). In the case of the newly-born idea, it might first be whispered to someone else (wind). A baby then enters a period of a lot of sleeping (night), and the communicated idea might start to tap into the collective unconscious of the people its been shared with (night). In both cases, this dreamy energy is setting the stage for what will become the highest potential of that baby, or that idea (seed). So on, the cycle continues through all 20 archetypes. I also mentioned the 13 actions (or “tones”) that these archetypes can take on. We cycle through 13-day mini-cycles (“wavespells”), where we’re all working with a common energetic theme. The tones tell us what plane to look for that energy on each day, (spiritual, physical, emotional, mental), and how the energy is driving us all toward our shared evolution. Again, I’ll give the first few as examples. The first tone is Magnetic (spiritual, attracting). This day we are attracting, from the source of all things, what the overarching theme of the 13-day cycle will be. The second tone is Lunar. (physical challenging). This day is all about challenging us to bring the new theme down into our physical bodies. (On a recent cycle, I noticed everyone around me was mountain climbing, or river rafting, or taking on some wild physical challenge on the Lunar day – Aha!). Thirdly, the newly embodied energy begins to bounce around within our physical forms, as Emotion (Energy-in-motion), moving into the Electric tone. Okay things are about to get a little bit mathy, as we move into the graph, here. If you’re not in a space to process numbers right now, feel free to skip ahead past the image, and we’ll meet for more philosophy there. Day (kin) 3: Electric Night (3rd tone, 3rd glyph). When we reach the bottom of the chart, we go back up to the first row, and start at the top of the second column. I’ve mentioned several times by now that the calendar lives as a process of inquiry. So how does one use the calendar to inquire? The way I’ve been taught, is through “day-keeping”. This means simply observing each day, with the knowledge of what glyph and tone are supposedly active that day, and asking the question “How do I see this showing up?” It might look a lot different than it’s “supposed” to… and that’s how we find the way the calendar lives for us. Fortunately, our brains are designed for finding patterns, so instead of looking to authority to dictate what “should” be, we’re taking an approach of looking for them ourselves. Now anyone with a love for science is probably tugging at their hair and screaming “confirmation bias!” at me right now. Yeah, I hear you. Of course I’m more likely to see something I’m looking for. But the point of this exercise for me isn’t to deconstruct life into objective categorized boxes. I want to wake up excited. I want to be fascinated about what each day brings. I want to feel myself in harmony with the endless beautiful systems of life that I’m spiralling around the galaxy with. And so, for now, I Day-keep. The new Mayan calendar year just started a few days ago (July 27), so I’ve ordered this year’s printed “synchrometer” (calendar workbook) from my teacher, Vasumi. If you want to play along too, you can get one here. If you want to go back to the simple stuff and just learn your Mayan Calendar “Sign”, you can do that here. Whatever depth you’d like to dive in to, I hope that dabbling with the calendar shows you the same permission to be and love and live exactly as YOU are… like it does for me :-).